of the most effective and respected real estate professionals in Indianapolis. 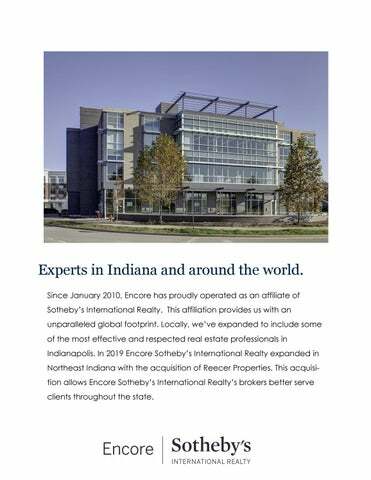 In 2019 Encore Sotheby’s International Realty expanded in Northeast Indiana with the acquisition of Reecer Properties. This acquisition allows Encore Sotheby’s International Realty’s brokers better serve clients throughout the state. 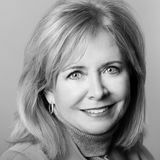 When compared to 4,500+ agents in the IRMLS, Lynn Reecer/The Lynn Reecer Team has been the #1 Ranked Agent for five consecutive years. In 2018, Lynn Reecer/The Lynn Reecer Team was ranked the #1 Lakes Agent in the state of Indiana. For residential properties in 2018, the average days on market was 114 days. In 2018, the average DOM for properties listed with The Lynn Reecer Team was less than half of the market average. sales price to list price ratio for their real estate transactions in 2018. Continued Growth In it’s 9 year history, Encore Sotheby’s International Realty continues to grow year over year by nearly every metric. Outstanding Photography When viewing Encore Sotheby’s International Realty’s listings online and in print, you’ll find each photo gives way to another spectacular photo. All homes, regardless of price point, are professionally photographed in order to showcase it in the most appealing manor. Extraordinary Video Sothebyâ&#x20AC;&#x2122;s International Realty continues to strive to present homes throughout the world in the most unique and innovative ways. A property featuring a video receives 400% more views than those without on sir.com. In 2018 Encore Sothebyâ&#x20AC;&#x2122;s International Realty will focus on delivering unique home experiences via live action video. These custom crafted videos are distributed with the listing throughout the world and the focus of our extraordinary videos channel on encoresir.com and youtube.com. Extraordinary Print Pieces Each home listed with Encore Sothebyâ&#x20AC;&#x2122;s International Realty will be represented beautifully in our print products. Whether a brochure or direct mail piece, each is created with flawless professional photography, well executed design, and high gloss finish. Extraordinary Email Campaigns Encore Sothebyâ&#x20AC;&#x2122;s International Realty offers the most beautiful and efficient email campaigns highlighting each listing with dynamic details. Emails are delivered to both our agents sphere of influence and the top brokers in the area. LIVE Magazine Encore Sotheby’s International Realty proudly presents LIVE magazine. A stunning printed piece devoted to our listings delivered alongside Indianapolis’ most targeted and focused publications— Indianapolis Monthly HOME and SHOPS magazines. The book is further distributed in Northeast Indiana alongside Fort Wayne Magazine’s May and October issues. Indianapolis Monthly Magazine Each month one extraordinary property will be advertised in a full page ad in Indyâ&#x20AC;&#x2122;s premier print publicationâ&#x20AC;&#x201D;Indianapolis Monthly. With a presence in the Indianapolis community for decades and over 40,000 subscribers with an average income above $179,000, Indianapolis Monthly presents an ideal location for displaying our incredible homes for sale. Fort Wayne Magazine With flawless design and exceptional print quality, Fort Wayne magazine is an ideal partner in displaying our extraordinary homes. Distributed to 10,000 homes in the Fort Wayne area with a household income above $75,000, the readership matches potential homebuyers. Additional Online Exposure With the search for homes often beginning online, Encore Sothebyâ&#x20AC;&#x2122;s International Realty will reach those consumers where they already are, both on their mobile devices and at their desk, via a strategic partnership with WTHR, Indianaâ&#x20AC;&#x2122;s news leader. Additional programmatic display ads will be utilized to broaden our digital footprint throughout the state. Social Media Exposure Encore Sothebyâ&#x20AC;&#x2122;s International Realty works diligently to harness the power of social media in the marketing of each of our listings. Our vast local and international online footprint will be utilized in marketing your home. Listing Presentation for The Lynn Reecer Team, Encore Sotheby's International Realty.